It can be painful and devastating to face dental issues like cavities, broken teeth, or tooth loss. Fortunately, you have hope for a healthy smile thanks to dental restorations. Drummond Dental Group is dedicated to helping patients across Montreal achieve smiles that are healthy and free of pain. Our team of talented dentists use their skill and experience to design, place, and maintain the restorations you need to enjoy a healthy, functioning smile. If you have problems with your dental situation, contact our office. We’ll do all we can to help make your smile the best it can be. How Do I Know if I Need a Dental Restoration? Typically, the dentist will be able to tell that you need a restoration from an exam, either by observing something during a visual exam or by identifying something on your x-ray. However, you should also make an appointment to see the dentist if you experience pain in your teeth, if a tooth is chipped or cracked, or if an old restoration has been dislodged or damaged. If you discover something about your teeth or gums but aren’t sure if it needs treatment, contact our office. We can listen to your concerns and help you determine what kind of care your situation needs. Dental implants are the latest innovation in tooth replacement. Capable of supporting everything from a single tooth to a full arch, more and more patients are choosing implants to restore their smiles. Our office places and restores dental implants, and can help design and secure your custom restoration to ensure it is comfortable, functional, and lifelike. If you’re missing teeth, implants can provide healthy and functional replacements. 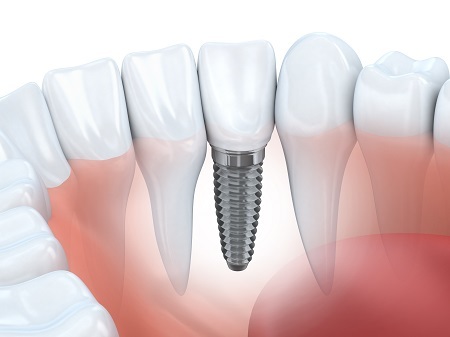 A titanium implant post is inserted into the jaw bone, where it fuses with the bone to become a replacement tooth root. This effect helps to preserve the jaw bone and protects your overall oral health. It also ensures the implant is sturdy and will stay in place. Once secured, the implant is topped with a dental restoration, such as a crown, bridge, or denture. Even if these restorations become loose or damaged, they can easily be replaced. The effectiveness and longevity of dental implants have made them a popular choice among our patients for replacing lost teeth. Implants are very versatile. They can replace a single tooth or multiple teeth, and support a variety of different restorations. When you come in for a consultation, the dentist will evaluate your dental structure to find out if implants will benefit you. Things such as the location of the missing teeth, the number of teeth missing, and your overall dental health are all carefully considered when planning implant treatment. The most important factor in getting dental implants is your jaw bone strength. To ensure the implant post is secure, you need sufficient jaw bone volume. If your jaw bone is too thin or weak to support an implant, additional procedures (such as a bone graft) may be needed to provide strength and density. Implant placement is a surgical procedure, so you must be healthy enough to undergo surgery. Talk with your doctor as well as your dentist, and be sure to let the dentist know your medical history and any medical conditions you have. Smoking has significant negative effects on your oral health and can make implant placement difficult. Not only does it contribute to gum disease – the leading cause of tooth loss – but it slows healing of the gums and bone. This makes it more likely for implant placement to fail. It is strongly advised that you limit smoking and stop tobacco use altogether if possible, both for your implant success and your overall dental health. As with any surgery, recovery takes time. The dentist and team will talk you through what you should do when recovering, but this helpful list can guide you if you need a reminder. Keep gentle pressure on the gauze pad placed over the implant area. Try maintaining pressure at 30-45 minute intervals until any bleeding lessens. Moisten the gauze with water if it dries out, and change it if needed. Minimize physical activity as much as possible. We recommend having someone to help you with basic needs during your initial recovery. Limit your diet to liquids and easily-swallowed foods such as gelatin, applesauce, yogurt and ice cream for the first two days. Use an ice pack to minimize facial swelling. Place the ice against your outer cheek at 20-30 minute intervals. After the first 48 hours, use a warm saltwater rinse every 1-2 hours to reduce the risk of infection. Do not use mouthwash, which can irritate the healing tissues. Brush the area around the site, avoiding any sutures. Do not directly brush or touch the surgical site. You can start eating soft foods after the first 48 hours, such as mashed potatoes, pancakes, and soft pasta. Eggs and milk provide good sources of important protein. Drink plenty of fluids, but do not use a straw for the first week, as suction may encourage bleeding. Avoid smoking or using tobacco for the first week, as it slows healing and encourages infection. Be sure to take all prescribed medication as directed. Contact us immediately or visit the emergency room if you experience itching or abnormal swelling after taking medication, which could be signs of an allergy. If a tooth has a cavity, the dentist will remove all of the decayed enamel to prevent it from spreading. Afterward, a filling is used to protect the tooth from damage and reduce the risk of another cavity. Fillings are one of the most common restorations, and a good filling can eliminate the need for a more advanced restoration, such as a crown. What are My Options for a Filling? There are two main options for fillings: amalgam (metal) and composite (white). Amalgam fillings have been used for over a century and are considered very reliable. Composite fillings use a special tooth-colored resin to fill in spaces and blend in with the surrounding enamel. They’re popular among people who don’t want their restoration to be easily visible. Why Is the Dentist Recommending a Crown? Your tooth has a large cavity. You’ve had root canal therapy on a tooth. Your tooth is supporting a dental bridge. You’re using a porcelain crown for cosmetic enhancements. What Are My Options for a Crown? Crowns typically come in metal, porcelain, or porcelain-fused-to-metal. Which type is best for you will depend on various factors. The dentist can discuss your options with you and work with you to decide. The dentist designs your dental crown to fit the shape and function of your original tooth. This design goes to a skilled dental lab, which carefully crafts the crown. Once it has arrived, the dentist will prepare your tooth by shaping the enamel, allowing the crown to fit perfectly over the tooth. After the crown is secured, you can use it to speak, bite, and chew just as you do with a normal tooth. Cantilever Bridges: These bridges are only supported by one tooth, rather than two. Maryland Bridges: These use wing-like projections at each side, which attach to the back of a tooth rather than covering it with a crown. They’re typically used on the front teeth where there is less pressure from biting and chewing. Implant-supported Bridges: These rely on implants placed in the jaw bone for support, rather than the neighboring teeth. This is the only option that also provides a replacement for lost tooth roots. The main differences between full and partial dentures are how many teeth are replaced and how the dentures are held in place. 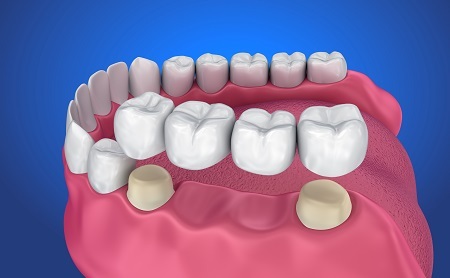 Partial dentures replace a group (or groups) of missing teeth in an arch. They use metal clasps to anchor onto remaining teeth to hold them in place. Full dentures replace an entire arch of missing teeth. They’re held in place by suction, dental adhesive, or a combination of the two. They are the most well-known type of denture and have been in use for centuries. At Drummond Dental Group, we believe everyone deserves a smile that’s healthy, functional, and complete. Our dentists work closely with each patient to create a unique treatment plan that serves their individual needs. Are you ready to enjoy a healthier smile? Schedule a consultation with our office to get your treatment started today.